This page contains examples of how to populate form values from the URL, block editor, shortcode attribute or filter hook. 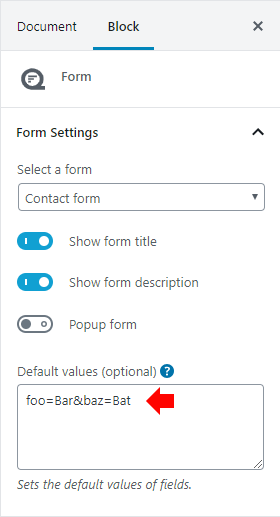 To allow form values to be populated you will need to go to the element settings and on the Data tab enable the option Dynamic default value, then enter a Parameter name (which should only contain letters, numbers, dashes and underscores). Form values can be populated from the URL, and should be URL encoded. Multiple values should be separated by an ampersand &. Some parameter names will interfere with WordPress when used as a URL parameter. Avoid using any of the values below as the parameter name when populating form values from the URL. See the full list of reserved terms on the WordPress Codex. The following example will set the field value to Some value. The value (when URL decoded) must exactly match the value of one of the preconfigured options. The following example will select the field value Option 1. The value (when URL decoded) must exactly match the value of one of the preconfigured options, multiple values should be separated by a comma. The following example will select the field values Option 1 and Option 2. The following example will set the First Name to John and Last Name to Doe. Warning: do not use the parameter name name, see the Reserved parameter names section above for more information. The value must be a valid date in the format YYYY-MM-DD. The following example will set the field value to 21 November 2018. The value must be a valid time in the format HH:MM (24 hour clock). Encode the colon as %3A. The following example will set the field value to 22:30. Form values can be populated from the Default values field in the block settings. Multiple parameters should be separated by an ampersand &. The value must exactly match the value of one of the preconfigured options. The following example will select the field value Option 1. The value must exactly match the value of one of the preconfigured options, multiple values should be separated by a comma. The following example will select the field values Option 1 and Option 2. The following example will set the First Name to John and Last Name to Doe. The value must be a valid time in the format HH:MM (24 hour clock). The following example will set the field value to 22:30. 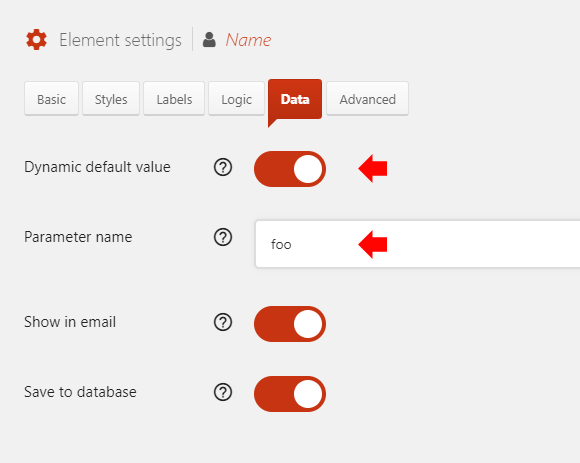 Form values can be populated from the shortcode by adding a values attribute to the shortcode. Multiple parameters should be separated by &amp;. It’s not possible to set the value of a Name element using the shortcode values attribute, due to a conflict between the shortcode syntax and query string array syntax. Please use the Block or Filter hook if you need to do this. Form values can be populated by a filter hook. The data type of the function return value depends on the element type, for reference see the Data types table. The code can be added to the WordPress theme functions.php file (or custom plugin). For these elements the return value is an array. Each value in the array must exactly match the value of one of the preconfigured options. The following example will select the field values Option 1 and Option 2. For this element the return value is an array. The following example will set the First Name to John and Last Name to Doe.